I wrote and published a book. More specifically, I self-published an eBook on Amazon. For me this was a defining moment in my life. I was actually able to complete something that I never thought possible. Having worked with my son over the past 5 years and counting, together we were able to build and grow a successful online business. So, why not reflect on how this mentoring relationship worked and share it with everyone who might be interested. 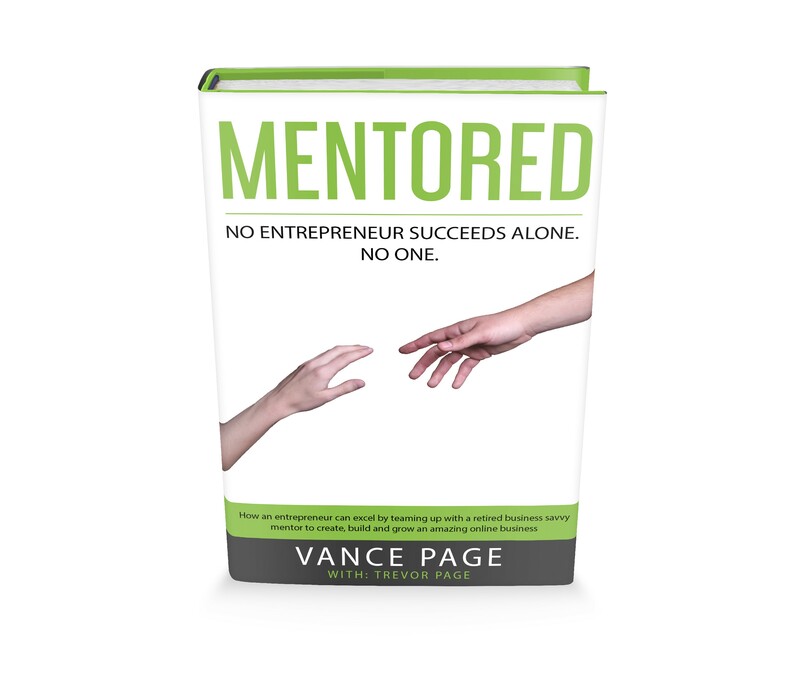 In this book titled “Mentored“, I hope to share the realities of what’s involved in building an online business and how working with or as a mentor can be the most helpful and rewarding experience to ensure the venture is an amazing and successful one. To reiterate, this book’s targeted audience is to both sides of the mentoring relationship. First, it’s aimed at the entrepreneur who is seeking guidance and support to build and grow an online business. Second, it’s positioned for the mentor, more specifically a business savvy retiree, who has the necessary skills to share and to transfer the wisdom and experience gained for the benefit of the entrepreneur combined with a strong feeling of accomplishment for the mentor. Who knew that retirement could provide anyone with the time and inspiration to achieve amazing things on that “bucket list”. This book represents my personal transformation journey and it should be enjoyed as such. Perhaps you too will be inspired to make the best of your passion. Yes, it’s a necessary duty for all businesses, big or small, to keep track of revenues and expenses, at least for income tax reporting purposes. However, there are many side benefits to recording these details into meaningful categories to help better understand where the money is coming from and what it’s being spent on. For a small business entrepreneur starting out, the recommendation is to set up a bank account, a PayPal account and a credit card account and let them keep track of your revenue and expenses. The next step is to install accounting software that interfaces or integrates with each of those accounts. Then all that’s required is to revue your accounting software account, on a regular basis, to categorize the revenues and expenses into meaningful buckets for further analysis. For the money, Wave Accounting is my favorite accounting software. Not only is it free (comes with sidebar advertising) for all of the basic accounting requirements for a small business, they also provide you with free 24-48 hour email support as well as options to add on software modules (e.g. Payroll), at minimal cost, when your company grows. Wave accounting software is being used by thousands of small businesses. The Accounting Lab people have even created a series of instructional YouTube videos to teach anyone on how to use all of the Wave features. Here’s a review of the Wave application from the folks at Cloudwards. I have now used Wave Accounting for the last 2 years with my son’s online business. There is no question that this software has saved me a lot of time and effort. The Wave team is always adding new features such as Bank Reconciliation. This feature alone ensures your records are always in sync with your bank, credit card and PayPal accounts. The Report Generation feature also provides instantaneous Monthly and Year to Date Income Statements, Sales Tax collected and spent as well as a current look at the Balance Sheet. This feature provides an immediate view of all necessary details required to prepare Sales and Income Tax returns without the hassle of creating manual spreadsheets. What do Retirees Really Need? It’s time to pivot. It’s time to dream up some new ideas. It would appear that retirees or soon to be retirees are only casually interested in launching an online business. I would love to continue publishing and sharing information on how best to launch an online business but I need confirmation that this is truly of interest to retirees. I do however believe that retirees are looking for something to fill their time with. The question is what is it? What are the top 5 things that retirees want and/or need? How could I help identify these? These are so many more but what are they? What are your top 5 wants/needs? The challenge is how best to convert these wants/needs into something useful and beneficial for the whole retirement market place? The converse to the wants/needs question is what are retirees or soon to be retirees really struggling with? What would be required to help resolve the problem or painful situation? Please feel free to email me at vance@retireandrecharge.com. Please note I have disabled the comments section on this blog due to the inordinate number of spam comments from people wanting to advertise their products or provide links to websites where the spammers can gain some sort of commission. I hate spammers. They ruin it for bloggers who simply want to share information. Thus the reason for providing you with my direct email access. Seriously, I would love to hear from you on what would make your retirement lifestyle a whole lot more enjoyable. Please email me at vance@retireandrecharge.com. In today’s post I am featuring someone who has accomplished just what I am trying to persuade retirees and soon to be retirees to achieve. His name is Joe Thomas. I don’t know Joe personally but I feel like I do. Through the wonders of the internet, I was searching for a golf league management software solution to help me manage my own golf league. To my surprise, there were at least 10 solutions I could choose from, right there on the first page of the Google results page. Naturally, with my technical background, I proceeded to check out all of these solutions. I created a spreadsheet with the features, membership costs, pros and cons etc. Since I had some very specific requirements for my golf league i.e. two divisions, net scoring, handicaps, match play points, automated scheduling etc., I then contacted the top 5 software providers to see if I could try out their software. Some had online demo capabilities which were helpful. Some had expensive solutions for the number of golfers in my league. In the end, I couldn’t really pull the trigger on any one solution, so I put my decision on hold. Besides, it was in the middle of a cold winter and I had time to figure this out later. Then, out of the blue, I get a follow up email from this guy, Joe Thomas. He wanted to help me figure out how to use his golf league management software to meet my requirements with only one exception. I figured why not give a try. Well, after an exchange of 14 emails with Joe, I was convinced this was the perfect solution for my golf league. I was so blown away with the incredible customer support I received, I asked Joe if I could feature him in this blog and thankfully he agreed to share his story. Why is Joe Thomas so Unique, you Ask? Well Joe Thomas is a retiree, just like me and you perhaps, who was looking to do something creative and challenging after his retirement. Joe is 67 years old who spent 33 years in the outboard marine plant where they made Johnson and Evinrude outboard engines. When Joe retired in 2001, he wanted to do something entirely different than what he had done in his previous career. Being an avid golfer since the age of 35, it was natural to want to do something related to golf. He dreamed about creating a Golf League website. Although he knew very little at the time about what it would take or how to go about it, thankfully his son had chosen Internet technology as a career and his knowledge would help Joe get the golf league management software solution launched in 2005. Joe has continued over the past 10 years to add new functionality to the point where the product is fully featured and very price competitive. Joe’s son, Joe Junior, was much too busy raising a family and developing his own career to spend a lot of time with the business. But he agreed to help Joe learn coding and did all the intricate work needed to set up the website and its associated programs. Today, Joe Junior is an IT manager for a lighting company in Waukesha Wisconsin. There is no doubt that being in business together, with his son over the years, has created a close relationship with many common interests. Today Joe is a fairly competent coder, who enjoys the work and interacting with customers to help them set up their golf leagues. 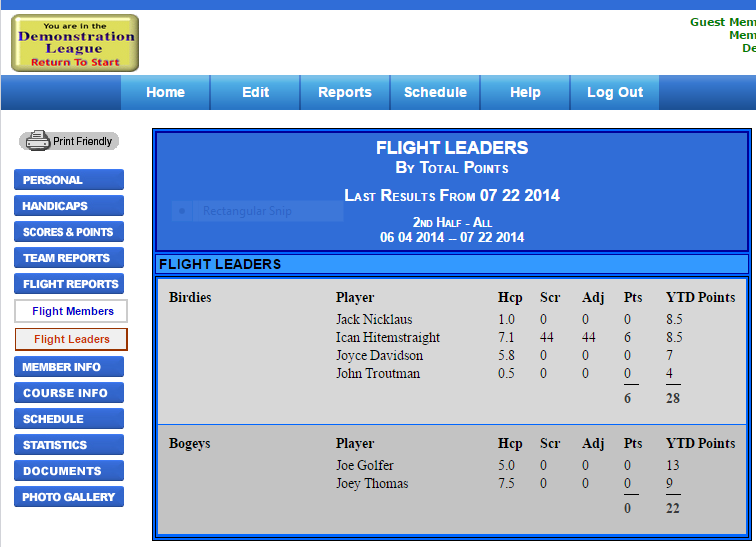 Today Joe’s Software as a Service (SaaS) www.golfleague.us has 6930 registered members and is growing annually. How amazing and inspiring is that? Congratulations Joe and thanks for sharing your story. Note that Joe and his son developed a software solution as a service (SaaS) to customers. This is very different than publishing a blog, offering a free lead magnet to obtain email addresses and then selling these customers digital products down the road. Developing a robust and responsive online software solution as a service takes a lot of skill and experience. Joe and Joe Jr. provided the right amount of collaboration to deliver this solution. Not everyone will have that combination of talent. However, if you have an idea that would require a software solution, this can be outsourced to qualified software developers. The software solution could either be a standalone software product or a software as a service solution. The challenge is finding the right kind of skilled software developers to complete the work required. Thankfully, there are websites (www.elance.com) that will match your requirements to developers who are offering their services. The huge benefit of a SaaS vs. a standalone software product, is the whole idea of recurring revenue month after month, year after year, assuming you continue to provide a quality product with continuous improvements. Keeping in mind that turning your passion into a business doesn’t automatically guarantee success. However, with the appropriate market research with a strong focus on who your potential customers are, then an only then, should you commit to launching your business idea. The www.golfleague.us membership site provides a fully featured golf league management solution to a niche market of golf league administrators. Golf is a growing business and new golf leagues are always being created. Golf league management can be very tedious and time consuming. Offering a software solution to reduce the overall effort is a fantastic idea. Golf league administrators will gladly pay for the right kind of software solution. Your challenge is to think of at least 10 business ideas. Then do the appropriate market research. Be sure to pick a business idea for a niche market where you will have a chance at success. You don’t want to be devoured by the bigger guys in a non-niche market. Get those creative juices flowing and commit yourself to deliver. Joe’s advice to retirees or soon to be retirees who are contemplating a challenge – “Do something you enjoy, put your whole heart into it and it will be a worthwhile endeavor”. It’s one thing to create and publish a blog post about a topic that you are familiar with but is it of any value to your intended audience? It’s so important to deliver that value and to gain an audience of followers and maybe someday, some raving fans. How does one go about doing just that? Who are you? How will Google find you? First of all, you need people to find your blog. For that you need to generate traffic to your blog site. There are several way to generate traffic to your website by us ing keywords, backlinks, social media presence or even purchasing traffic through Facebook advertising. Checkout a blog post that my son Trevor published about Search Engine Optimization. This beginner’s guide will help to at least get you’re your blog recognized by Google in its search algorithm for any potential organic traffic. 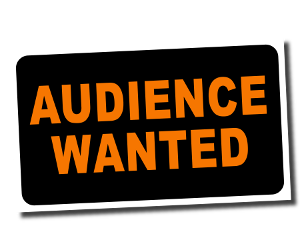 Then to make further inroads to building your audience you can view this blog post by son Trevor on Building an Audience. 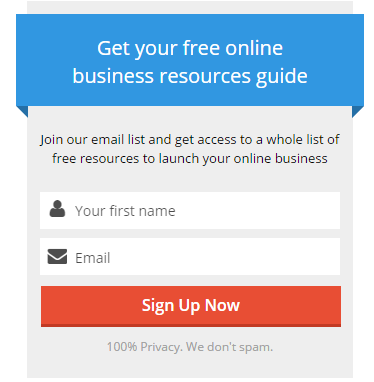 How does one go about building your very own email list of potential customers? You need to give something to get something. You need to provide a potential customer some added value over and above your informative blog postings. After all, not everyone is willing to give you their email address just for asking. You will notice that I generated my very first value offer (see sidebar) for someone to join my email list. I did a lot of research into all kinds of technical and educational resources that one could need to help build an online business. I then documented these resources with all of the corresponding links to the vendor websites. I also included references to expert blog postings that can help a beginner get started. The idea is simple, give something of value in exchange for an email address. This is what is called a lead magnet. The more email addresses you collect the more potential customers you could have down the road when you decide to market and sell your products. Once again, there are free tools on the market to get you started building a lead magnet. One tool I ended up using was the one from https://fatcatapps.com/optincat/. You can click on the demo video to learn how to set up and integrate a customized version of your very own lead magnet plugin into the sidebar of your blog, very much like I was able to on this blog. It’s important to note that creating a lead magnet on your blog to capture email addresses is one thing but you need to store them somewhere and to follow up with these individuals to thank them for providing their precious email address as well as delivering the free product you were offering them. To accomplish this part you will need to integrate the lead magnet capture information with your email management software. In my case, I am using MailChimp. As it demonstrates in this demo video, you will need to copy and paste in the MailChimp API key so the OptinCat plugin can communicate with your MailChimp email list you will create as described in the next section. How to Capture and Store the eMail Addresses? The second portion of setting up a proper lead magnet involves capturing and storing those email addresses in a separate list with the MailChimp software. MailChimp software is free for the first 2000 email addresses you collect. So plenty of time to trial and error various lead magnet email sequences to confirm email addresses, thank and welcome your brand new customers onto your email list. A demo of how the email sequence can be set up can be viewed in this video. It’s important to note that I implemented the lead magnet on this blog without any outside help. I simply followed the demo videos and installed it. Trust me, I was amazed how easy the whole process was. Granted there was some initial apprehension whether I could ever complete the task successfully but what’s the worst that can happen? The key is to develop a solid and valuable lead magnet you can offer for free in exchange for an email address. Those email addresses you collect are like gold. They will serve you well if and when you develop your core product which you can offer at a reasonable price, to your precious list of loyal customers on your very own email list. Start thinking about what kind of valuable information you could offer as a lead magnet. It doesn’t have to be a huge undertaking, like creating a whole eBook. You just need to offer something of value that would be of interest to your following. Then perhaps down the road your core product could be an eBook, a video tutorial course or a series of helpful tips in your specific knowledgeable area of expertise. In the words of golf professional and teacher, Michael Breed, “Let’s do this”. You have finally decided on your best fit business idea. You have researched it thoroughly to ensure a genuine interest exists in the market place. Ideally your business idea is in a niche market where competition is in the low-medium range. Now it’s time to start sharing your knowledge and experience with the world through your own blog. “A blog (a truncation of the expression weblog) is a discussion or informational site published on the World Wide Web and consisting of discrete entries (“posts”) typically displayed in reverse chronological order (the most recent post appears first)”. The best way to publish your most useful content is through the most popular www.wordpress.com blogging tool. For new bloggers the WordPress tool is not only free to use, it provides numerous templates to best illustrate your specific content in a manner that is most convenient for your target audience to enjoy and engage with you. What type of Blog Content will you Post? You will need to give away lots of free content to have any chance of building an audience or a community of interest. You will need to reach out to that audience in the future for potential customers of any digital information products you wish to market and sell. What will you Name your Blog Site? 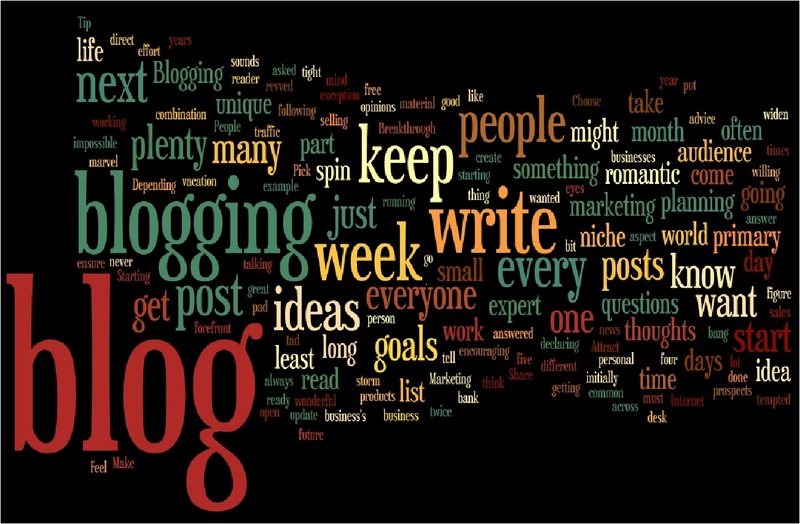 Have you been thinking of a catchy name for your blogging web site? There are lots of web domain search sites that can be viewed to see if your site name and suffix is even available. Once you decide on a good name, for example, www.yourblogname.com, then you will need to purchase that web domain name from a web hosting company, like www.godaddy.com. Most host service companies will provide you with the ability to review available web domain names and provide you with the ability to select your monthly hosting service. They also provide you with the ability to integrate directly with the WordPress framework to set up your blog seamlessly. This is the first monetary investment required in your journey to launching an online business. Typically a domain name can be reserved for anywhere between $10-$15/year. The hosting service for your blog content can typically be between $3-$5/month. So the overall yearly cost of running your blog would be $46-$75/year. An incredibly cheap investment to make for a new company startup. Note, I have yet to mention any cost associated with setting up a legal business entity, be it a registered or incorporated company. I would leave that until later when you decide to monetize your blog and actually start to make any income through the sale of digital information products, affiliate marketing etc. Now how best to go about setting up your blogging web site on WordPress? Again, thankfully there are lots of free video tutorials out there that will teach you step by step what’s required. One video that I particularly enjoyed was a free one published on the www.udemy.com site. The instructor is Mike Omar, publisher of many books on the subject of online business. The blogging course can be viewed at https://www.udemy.com/how-to-make-a-website-or-start-a-blog-with-wordpress/. Mike provides a very thorough step by step instructional video that any beginner will be able to follow. You are probably wondering how Mike can provide his course for free, well that’s where affiliate marketing comes in. You will notice that Mike is suggesting to use a specific web domain and hosting service in this video. This is one of many domain and hosting services available. If you decide to click on the one Mike suggests and actually purchase the service, then Mike gets a commission on that sale. Mike has been blogging and creating digital information products for a while so he can provide some valuable lessons learned. OK then, are you ready to start creating your brand new blogging web site and your new blogging theme? Are you ready to start creating your very first blog posting? It’s time to take action and to spread your words of wisdom. Be thoughtful, be genuine, be transparent, be helpful and most of all be yourself. Have you written down all of your good ideas for a potential online business? Have you talked to your friends and family about any of those ideas? Did you get any WOW! That’s a fantastic idea why don’t you do something with that? Well before you launch into action might I recommend you do a lot more research? If you recall, you and your friends might think it’s a good idea but will anyone else in the world feel the same way? Part of the whole idea of the validation process also involves some internet research. Everyone surely knows how to Google a subject. The amazing thing is you most likely will get a million results for whatever topic you key in. The important thing is to note what are the top results returned on the first Google results page. This list of first page results tells you how many people are really interested in this topic. Why because Google’s page ranking algorithm determines that very fact. These first page results are there because they have received the most traffic to their individual sites and they are considered to be most relevant to the topic being searched. Now if the first Google results page contains a number of web sites that don’t seem to really satisfy your search idea/subject then perhaps there is an opportunity for your idea in this niche market. On the other hand, if there are several sites that have valuable content on your idea, then you know your idea is in a very competitive market. A rule of thumb that could be used is if your idea/topic has less than 15 million search results then you are most likely in a less competitive market with a better chance of being successful in this niche. Anything that results in more than 15 million search results is likely way too competitive for your online business idea. Doing keyword searching with adwords.google.com. Sign up for free and then click on keyword planner to check out if you’re topic/subject/idea is being looked for in google searches. This tool is used to estimate what it would cost you to purchase advertising on a pay per click basis and by how many times it shows up (impressions). I’m not suggesting it’s time to purchase advertising, however, for planning purposes this tool can help you decide if the idea is a great one. For example, look at the competition level shown in the tool. Is it low-medium? Then perhaps your idea could work. If it’s too high, then it probably isn’t a worthwhile idea because there is too much competition and little room for a brand new entry. If you don’t find any results then it’s probably not a great idea at all. As mentioned in my previous blog postings, I have learned a great deal about building an online business from my son, Trevor. Trevor actually has three different online businesses. His latest one is to blog and podcast on how programmers can learn to start up their own business by creating digital information or software products. As of this blog post, he had already recorded over 20 episodes. This episode on How to Choose a Business Idea provides some additional suggestions on how to go about finding that business idea that best fits your area of expertise. These books will not only help you find a business idea, they will inspire you to carry on. So, make it your mission to do the research and find that niche market where you could begin your journey into building your awesome digital information product. Why Even Work During Retirement? You worked for so many years to finally earn that elusive right to finally say, “I’m retired”. You just want to sleep in, relax and enjoy that leisurely life that you so deserved. However, you will most likely find something missing in your retirement life. It’s just human nature to explore. For some people, the need for connection to the outside world becomes overwhelming. Then thoughts of perhaps taking on a part-time or even another different full-time job start to creep in. 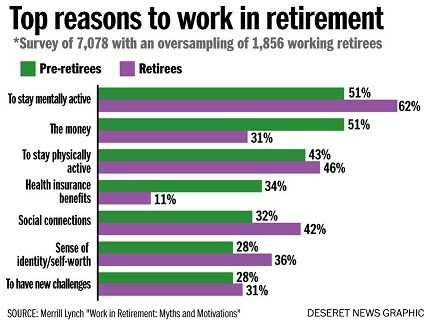 As per the chart, the main reasons retirees prefer to keep working to some degree during their retirement is to stay mentally and physically active. These reasons are followed by maintaining solid social connections and a strong sense of identify or self-worth. Granted some retirees would prefer to keep working full time past that typical retirement age of 65 or 67or whenever government pension benefits kick in. Others might want to balance their work life with some retirement pleasure by only working part-time. Either way, it’s an opportunity to hopefully do something you love. A chance for a do-over where you can try something you would have, could have or should have done, if only you had the knowledge and wisdom you have accumulated now. Baby boomers have developed a significant number of skills over the years, not to mention, a very good understanding of what can be accomplished over the internet. The question is – what wisdom could you share with the world that would help solve a problem, satisfy a need or provide guidance for a large number of people? Think about it! If you’re retired or about to be retired, you know there will be hectic times and down times during retirement. Why not challenge yourself mentally during those down times to do some research into an idea that could keep you mentally active and perhaps even earn some extra income down the road. I am not the expert here on this whole subject of starting an online business but I have done the research, I have learned from my son’s online business as well as following a few experts in the field of internet marketing and online business. It’s a very interesting and mentally challenging opportunity for anyone who wants to give it a try. The sense of achievement can be so rewarding. In effect you would be learning a new set of skills while leveraging your own knowledge, experience and wisdom. Again, given the right mindset to begin the journey of launching an online business, the first thing you need is that big “idea”. You probably have lots of good ideas, even some great ideas but will any of them have a chance at success. Be sure to write down your ideas and research the internet to see what’s out there. Don’t be alarmed if someone else has a similar idea or solution that just means there is a market out there for that idea. One of the experts in the online business world I have been following for over two years now is Pat Flynn from smartpassiveincome.com. One of his blog postings 5-reasons-your-next-big-idea-might-fail addresses the whole idea why some ideas just simply fail and what you should be aware of. For example, you might have a lot of experience in woodworking, project management or consulting. However, these topics might be too general or involve to large a competitive market where it would be very difficult to successfully launch an online business. However, if you had a lot of experience, for example, in a niche market like teaching interested people on how to play bridge. Then you could offer that experience, with some authority, a series of video tutorials as well as a series of eBooks on various bridge techniques, this could be a better opportunity for success. The next step would be to validate that idea by either surveying your friends and family, purchasing some reasonably priced Facebook ads that target a specific market to see if people actually like the idea or perhaps even pre-selling the online course and/or eBook to people online to verify any would be buyers. If you receive any meaningful feedback and results, then you’re onto something. If not, and you pre-sold your product, then you could simply refund the money. It’s so critical to validate your idea before spending an inordinate amount of time developing your product only to see it possibly fail to launch let alone record any sales. These are guidelines that have been published by the experts in this field. They make sense. This is only the beginning of this journey. Having a winning idea is one thing. Marketing that idea or product is where the real challenge is. For that you need a presence on the internet and that’s where learning those new techniques and skills really begin. The amazing fact is there are several online marketers who offer their wisdom through blog postings, podcast episodes and video tutorials – all for free. I will share with you some of these expert websites. You will be amazed how much information is available. All you need is time to learn. As retirees or soon to be retirees, time is one thing we should have lots of. It’s just a matter of balancing your time between something mentally challenging with your whole retirement lifestyle. I will state my disclaimer clearly and simply. The techniques used by these experts were extremely successful for them but it doesn’t mean they will be successful for everyone. Otherwise everyone would be launching online businesses. However, as retirees we do have an additional advantage. We have accumulated years of business knowledge and acumen that we can leverage throughout our retirement years. The key is to find that “idea” for a product or solution that would be of interest to many others. It’s time to start brainstorming ideas. My suggestion would be to seek out a friend, your son, your daughter or your spouse and bounce off ideas to see if any of them stick. Then let the momentum begin. As mentioned in my previous blog post, I am committing myself to publish a step by step approach on how I will create and build an online business from this blog. By achieving this, I am hoping that you too can benefit from this journey. Granted, I have already made the first step by creating this blog. I will demonstrate how that can be accomplished in an upcoming blog post. These are common emotions that we all possess at one time or another. The challenge is to overcome these roadblocks and to demonstrate to yourself that you can achieve something you never would have thought possible. People do challenge themselves to achieve unbelievable results. Like running a 10K run or even a half marathon. Some have tried parachuting out of a plane. Then some of us would just rather challenge our minds and create something that might actually turn out to be useful and helpful to others. With the right mindset and the motivation to succeed is crucial before even thinking about starting an online business. Even then, there will be failures along the way. However, these failures can be incredible learning experiences to build on for any potential future ventures. My first objective in starting an online business was to research the market I’m focussing on, that being the retirement or soon to be retirement community. What do retired people really want or need? What would make retirement life a more enjoyable time? What opportunities exist out there for the retirement community? What would help to improve the overall retirement lifestyle? Asking those type of questions would be the beginning of creating an idea for a potential solution to help satisfy a need or want. However, how do you know if that potential solution would be of any real interest to your target market? I will address that in the next blog posting on how best to validate your idea through sampling of your target market. I have spent the last year reflecting on what else I could do to challenge myself, to help stimulate my interests and to keep myself more mentally active. I have already talked about preparing for retirement, the retirement process and making the best use of our time. But I want to do more and you should too. Our lifetime is so precious. We need to contribute more to society as a whole. We need to help and serve people to keep busy during their retirement. Too much relaxation will tend to dull your senses. I am personally going through that period of time in my retirement now where there is more time available to take action to stimulate the mind. Hopefully with something that’s exciting. Then it hit me. I have learned so much from my son’s entrepreneurial online business, I thought this might be of interest to many other retirees who are looking for something to increase their mental activity and to perhaps even supplement their retirement income with their own part-time online business. So, I am changing the game for the next few blog postings. I plan to publish several posts on a streamlined approach to creating and running your own small online business. Granted I will be taking several lessons learned from my son’s successful business and simplifying these into a step by step approach which I will also be implementing along this journey on this very blog page. The price of entry into an online business is so minimal – it’s unbelievable. There are so many tools available for the beginner and lots of them are free. I plan to provide detailed information on these tools and how to actually use them, because I will be implementing these same tools as I build my own online business. We will be experiencing the whole journey together. This should be fun and I do hope you too will be inspired to challenge yourself to learn something new and most of all, to share your knowledge and help others.